In the summer of 1812 Britain stood alone, fighting for her very survival against a vast European Empire. Only the Royal Navy stood between Napoleon's legions and ultimate victory. 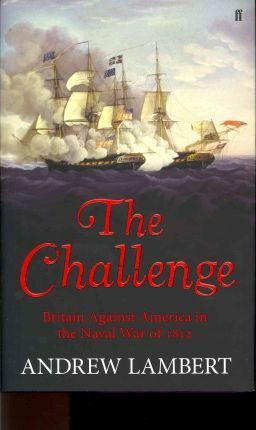 In that dark hour America saw its chance to challenge British dominance: her troops invaded Canada and American frigates attacked British merchant shipping, the lifeblood of British defence. War polarised America. The south and west wanted land, the north wanted peace and trade. But America had to choose between the oceans and the continent. Within weeks the land invasion had stalled, but American warships and privateers did rather better, and astonished the world by besting the Royal Navy in a series of battles. Then in three titanic single ship actions the challenge was decisively met. British frigates closed with the Chesapeake, the Essex and the President, flagship of American naval ambition. Both sides found new heroes but none could equal Captain Philip Broke, champion of history's greatest frigate battle, when HMS Shannon captured the USS Chesapeake in thirteen blood-soaked minutes. Broke's victory secured British control of the Atlantic, and within a year Washington, D.C. had been taken and burnt by British troops. Andrew Lambert, Laughton Professor of Naval History in the Department of War Studies at King's College London, brings all his mastery of the subject and narrative brilliance to throw new light on a war which until now has been much mythologised, little understood. Illustrations note Illustrations (some col.), maps, ports. Andrew Lambert is Professor of Naval History at King's College, London. His books include Nelson: Britannia's God of War, Admirals: The Naval Commanders Who Made Britain Great and Franklin: Tragic Hero of Polar Exploration. His highly successful history of the British Navy, War at Sea, was broadcast on Channel 5.